Millions of people in El Salvador depend on money sent home by their loved ones in the United States. They use it to buy homes, groceries, school supplies and other essentials of everyday life. The Trump administration's decision Monday to end protections for about 250,000 Salvadorans in the United States puts those payments, known as remittances, at risk, experts say. "They are the lifeline of those families," said Cecilia Menjívar, co-director at the Center for Migration Research at the University of Kansas, and a native of El Salvador. "If remittances decline, the country will collapse." 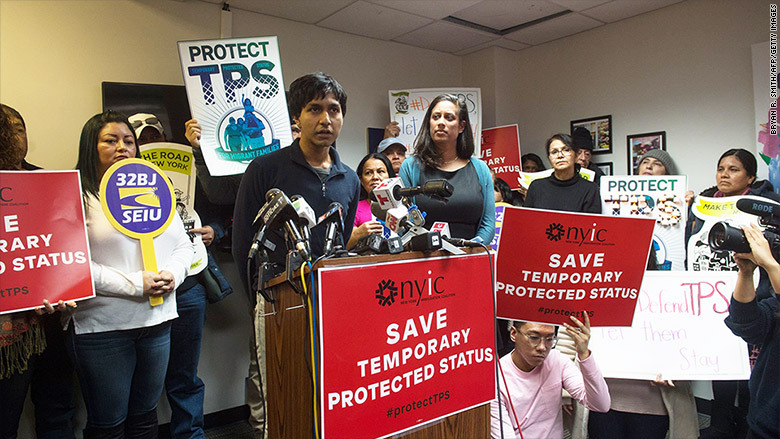 People protected by the program, known as Temporary Protected Status, will have until September 2019 to leave the country or find other means of staying, according to the Department of Homeland Security. 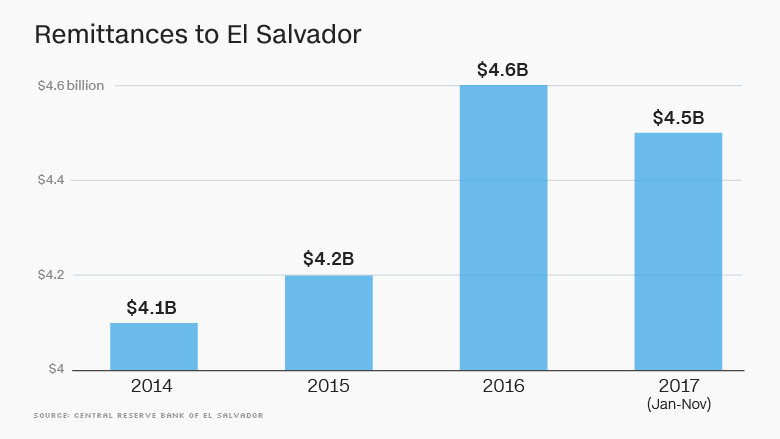 Salvadorans in the United States sent home a record amount of money in 2016, and the totals from 2017 are on pace to break the record. From January through November, Salvadorans sent home $4.51 billion in remittances, according to the country's central bank. For all of 2016, Salvadorans mailed $4.57 billion to family and loved ones. That's a huge sum for a relatively poor country of 6 million people. The entire economic output of El Salvador last year was $27 billion, according to estimates from the International Monetary Fund. Mexico has about 20 times as many people and took in only about six times as much in remittances through November. The amount of money sent home to loved ones also dwarfs the $88 million that El Salvador received in aid from the United States last year. It's uncertain what will happen to remittances in coming months. Experts say Salvadorans in the United States could decide to send as much money home as possible before the protections end in 2019. They also caution that American employers may fire Salvadoran employees who will lose their ability to keep a job. In the long term, though, if hundreds of thousands of Salvadorans are forced to return to their native country, remittances will fall significantly, they say. Families use the money to keep kids in school longer, according to Christine Wade, a professor at Washington College in Maryland who has published research on El Salvador. School fees are one of the many expenses families cover with remittances. Wade argues that a decline in remittances would almost certainly mean less class time for children. "This policy shift has all sorts of unintended consequences that people just aren't thinking about," Wade said. "This decision is likely to only increase migration because it's only going to make things worse for the Salvadoran economy." --CNN's Catherine Shoichet contributed reporting to this article.